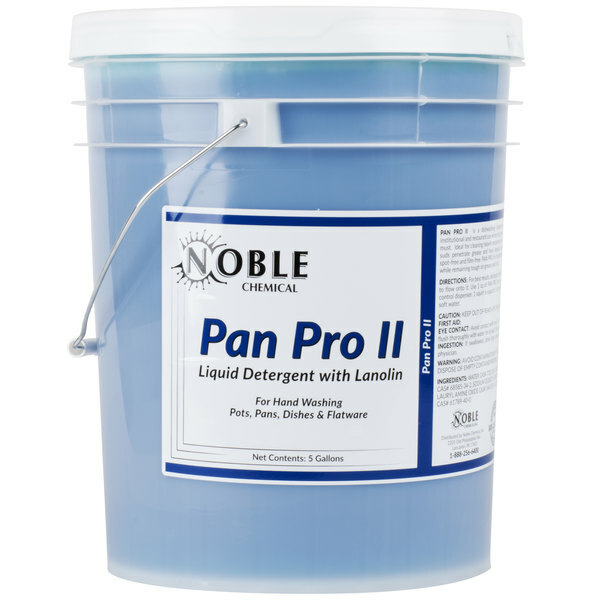 Give your pots, pans, dishes, and flatware the care they need and deserve by hand washing them with this Noble Chemical Pan Pro II pot and pan soap. This liquid detergent contains lanolin, and is perfect for use in industrial, institutional, and restaurant settings where grease emulsification and lasting suds are a must. Although this liquid detergent is tough on grease and fats, it is easy on your hands and dishes. For additional user convenience, the 5 gallon container comes with an integrated handle for easy transport from one location to the next. First scrape and remove as much solid food and waste as possible. Wash dishes and pans in recommended dilution of PAN PRO II. Rinse thoroughly in clear, hot water.